Strolling around a lively Covent Garden on a balmy spring evening, clutching an ice-cream and navigating the narrow, cobbled streets is a simple pleasure but a rare one. It brings on that familiar 'holiday mood', eliciting some past happy, carefree times abroad. And when the ice cream you are indulging in is special – a thick, crispy cone topped with indulgent, creamy gelato – so is the experience. Amorino on Garrick Street is a beautiful, elegant ice cream shop. The exposed biscuit-coloured bricks and wooden beams give this parlour a traditionally Italian look and feel, while the cherub statues and chandeliers add a sense of opulence to the occasion. On top of the display sit glass jars of Italian biscotti biscuits, while underneath the sneeze guard is a vast selection of ice creams, gelatos and sorbets – all beautifully presented, organic and free from preservatives, artificial flavourings and colourings. Choose from the classics like vanilla, strawberry or tiramisu, or give your cone the 'wow' factor with the addition of something more unusual: dulce de leche, speculoos biscuit or passion fruit. The display is brought to life with Nutella swirls, fat hazelnuts and sprinkles of crushed salted or whole sweet pistachios. And if you can't decide on just one flavour, mix and match! Whatever you decide, it will be served by one of the friendly staff with a spatula rather than the conventional ice cream scoop. A spatula is the preferred way to serve gelato; a skilled technique that creates frozen art and will have your treat looking more like a beautiful flower than an ice cream. 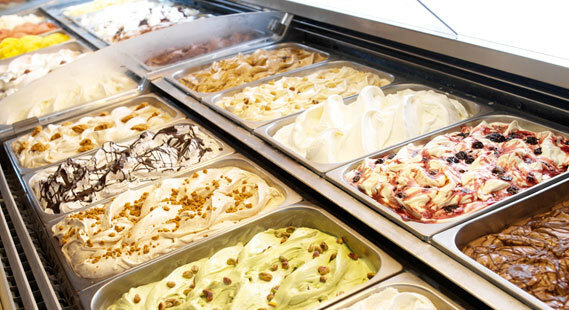 It is easy to see how this gelato shop has become a successful international chain since its establishment in 2002. As well as Covent Garden, its UK stores are also located in Soho, Chelsea and Oxfordshire so there's no excuse. This summer treat yourself to an experience of Italy and pop into Amorino. The berry gellato in the right hand corner of the picture looks very tempting. I've been to the Soho branch in Old Compton Street, and the ice creams are the best I've eaten outside of Italy. As soon as we get some good weather, I'm in the mood for ice cream and this place looks great. Thank you so much for your very nice review !